My family decided to have a small Super Bowl party for some of our close friends and neighbors to root on the Denver Broncos. Despite their epic loss, the party was fun, the halftime show was good, there was great food, and I won a little extra money on the side playing a game my family calls football pool (I'll explain that later). I've always been a Denver Broncos fan since I was little, so I was ecstatic that they had won the American Football Conference (AFC) and were going to Super Bowl XLVIII to battle the Seattle Seahawks. The boys had a great season, and I was pretty confident that they would pull out the win at the Super Bowl, but unfortunately, that didn't happen. The Seahawks crushed the Broncos, 43-8. Although I'm still a bit sad about it, I'll still stick by my Bronco's side. The other best parts of the Super Bowl besides the game are the commercials and the half time show. 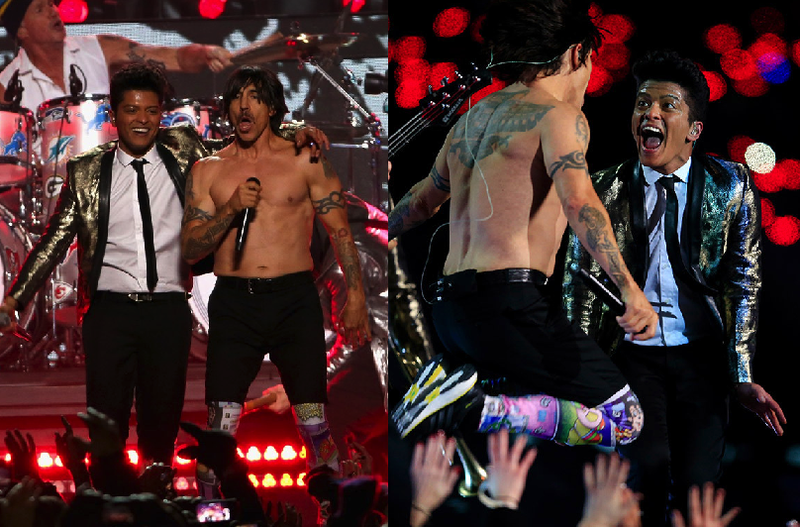 Bruno Mars was the main half time performer alongside The Red Hot Chili Peppers. A lot of people weren't too excited about that, and most people said there's no way he could top last year's performer, Beyonce. I thought he did a great job though. Bruno is a great performer, dancer and singer, so I loved the half time show. I also loved his super skinny tie and metallic blazer. The little Red Hot Chili Peppers performance wasn't so bad either. You can check out the full performance below. As far as the commercials went, I didn't think they were really that funny this year. There were only a few that stood out to me: a heartwarming, tear-jerking Budweiser commercial featuring a puppy and a clydesdale and a funny Dannon Oikos commercial featuring John Stamos and a little Full House reunion. Check them out both below. Last, with a party comes lots of great food. Everyone who came brought an appetizer with them and my family covered the main dishes and desserts. One of my favorite appetizers were homemade pizza roll-ups. Click here for a similar recipe. My parents made some delicious filet mignon sliders, and I made my famous peanut butter bars. They're easy to make and really addicting to eat. Stay tuned for a recipe post later this week. So back to what football pool is. It's a game that has no strategy, it's all just luck. There are 100 squares that people can buy - we made two posters this year, one was $1 per square and the other was $3 per square. 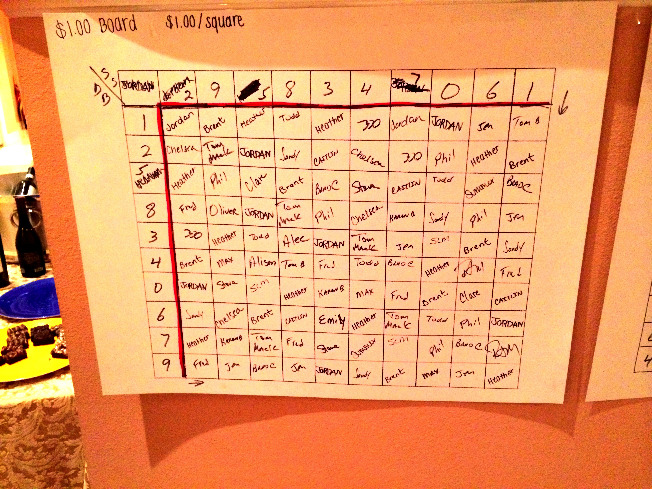 Once all the squares are filled in, you label 0-9 at the top and the left side in a random order. You split up the pot for each quarter, so $20 each (for the $1 board) and $20 for overtime, just in case. After the first quarter, you match the numbers to see who's box it lands on. For example, after the first quarter the score was 8-0, Seahawks, so you find the 8 at the top and the 0 on the left side and see which box they land on, which was the box with my name on it! So I walked away with $20. Sort of hard to understand, but it's a fun game to play with everyone. What did you do for the Super Bowl? Did you have any favorite commercials? 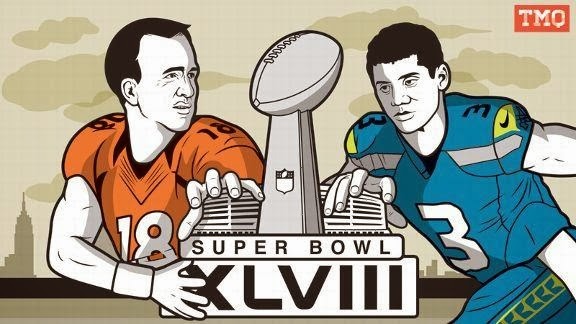 I've also been a football fan for my whole life, so the Super Bowl is one of my favorite nights of the year! I loved the Budweiser commercial as well, and football pool looks like a fun game, I think my family would really enjoy! I got to explore Super Bowl boulevard in Manhattan last weekend, it was very cool! I'm glad you had fun, despite the rough ending. I saw the bruno mars show! perfect!! I agree that the commercials were not that great this year! It was kind of a let down. Your party looks fun! Lots of yummy food! I was sadly studying for a neuroanatomy test, but I caught parts of the game and of course the halftime. Looks like you had fun! oh your feast looks so yummy! !